Life in a Typewriter Shop: Underwood No.4 Repair And More! Underwood No.4 Repair And More! A 1902 Underwood No.4 in very good condition now. The linespace selector is on the side of carriage end cover. The ribbon reverse is a lever below the advance wheel. The smaller keyboard looks a little strange. This 1936 Corona Special is indeed special. The touch control is on the side of machine. You can see why people call this the tuxedo model. I'm warming up to typing on these Underwood Noiseless Portables. Needless to say, I'm keeping this machine for myself. This is one of my favorite stickers. This tag is nailed to the faceplate. Wow! That's a great Underwood number 4 you have there. I thought they were common in the US, and the #5 was supposed to be the export version with extra keys. What is the serial number on your #4? Does it have the Wagner decal at the back? I got SN 3932-5 here. As much as I'd like one of each of those fine looking typewriters I have to say the Corona Special would be my first choice. 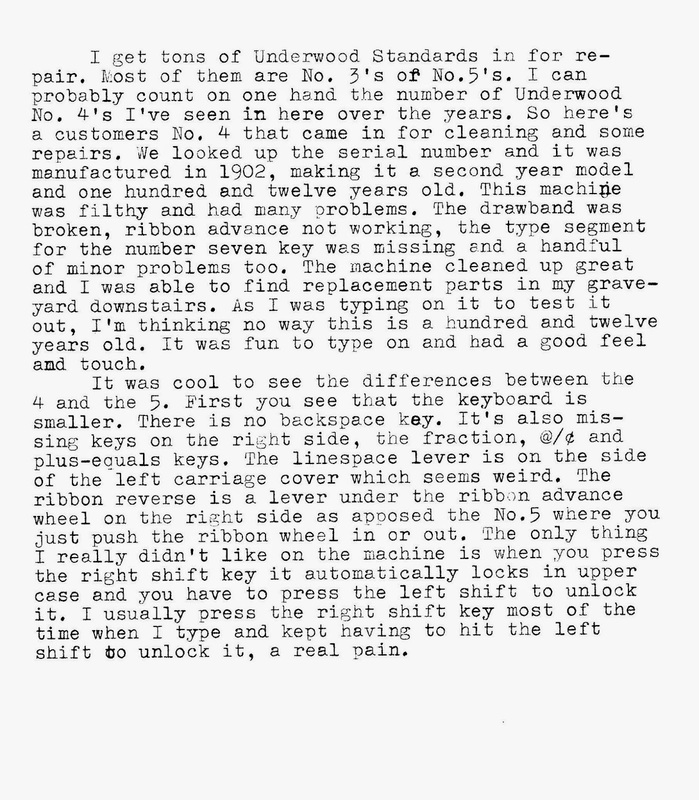 I love the fantastic work you do on all typewriters. Lots of interesting and beautiful sights! Love the "Witch City" decal -- does Salem still use that nickname? 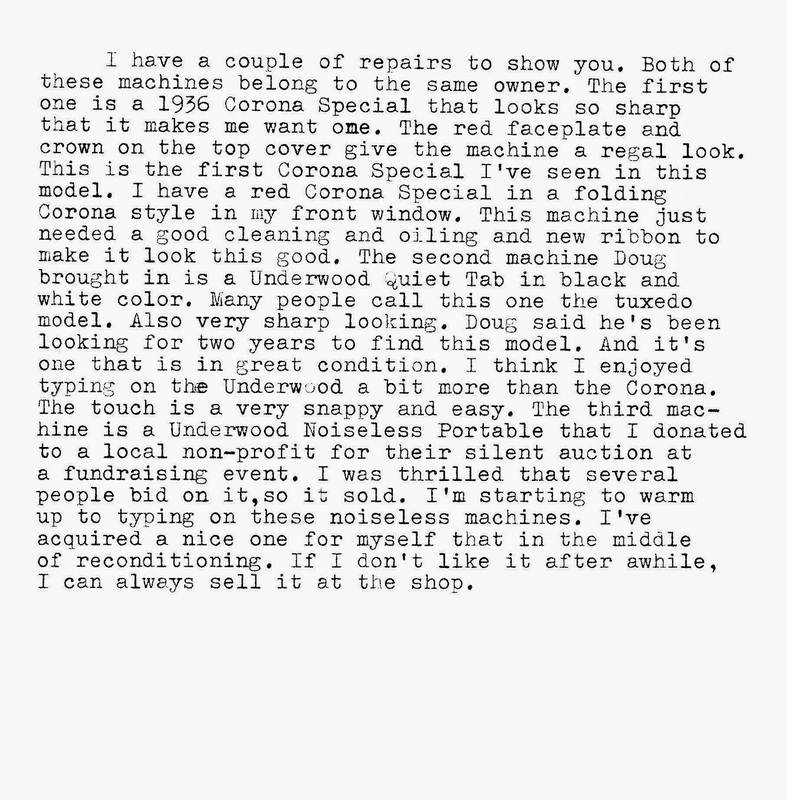 The odd controls on the Underwood 4 and Corona Special were eye-openers for me. And it's nice to see that Agent Eugene flew in! It's the pigeon! So glad to see it's still flying around the typo sphere! schrijfmachine- The No.5 is the common model in the U.S. you rarely see No.4's. The serial number is barely over 10,000 and there is no decal on the back other than Underwood. That's awesome that you have such a low numbered one. Thanks! 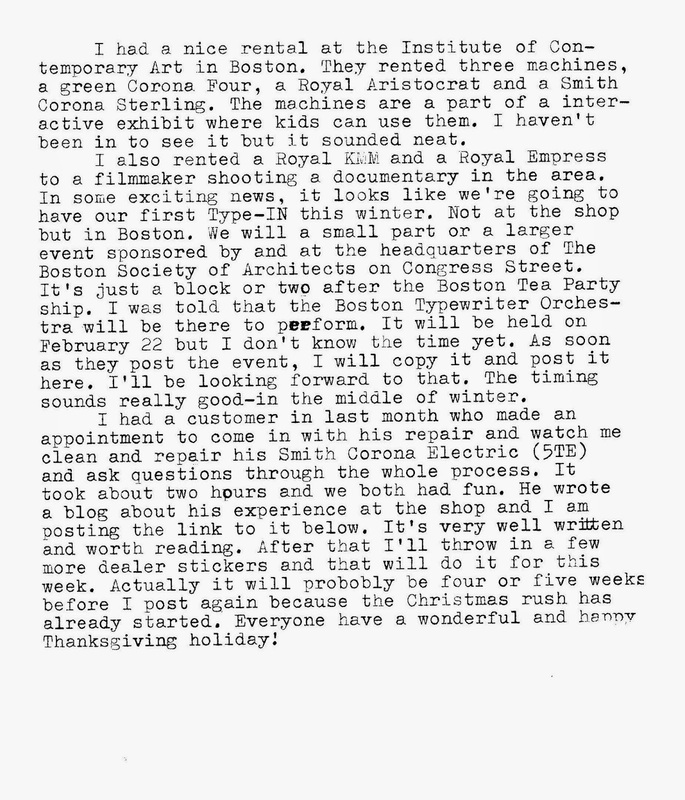 Bill M.- Thanks Bill. I'm with you on the Corona Special.